The director, whose latest offering Ready Player One is out this week, told Sky News that he feels blue once production is over. He said: "It's hard, recovering is hard, I go through a sad, low period, not just after the film is done-done and out in the public, but when I'm done shooting. "We've had such an intense relationship - all the actors, the crew, together, all of us - and when it's over, it's over, and it's sad because I know that I'll see some of the people again and I won't see others ever again. "We're a little bit like a gypsy enclave and it's always been that way. "I've never quite gotten over the sadness when we have to have a wrap party - I rarely go to wrap parties because it's just too sad for me. "The filmmaker is currently promoting his second film to be released this year.Ready Player One is a sci-fi spectacle set in a dystopian 2045 when most people spend their days living in a virtual reality game called The Oasis. 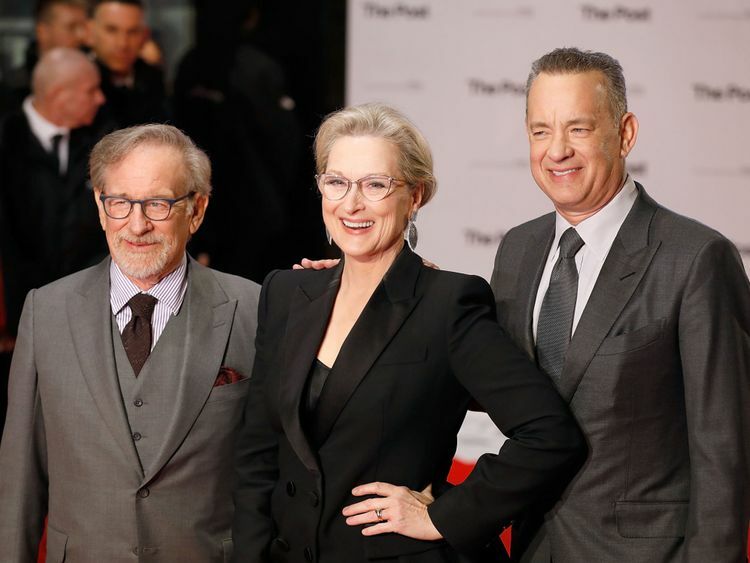 Its release comes just two and a half months after his most recent film The Post.The drama starring Meryl Streep and Tom Hanks earned two nominations at the Academy Awards, including best picture, so it has already been a busy 2018 for Spielberg, who admitted that that's how he likes it. "I do, I like being busy, I do not like sitting around," he said. "One thing I don't like is just sort of [being] stagnant, I need to keep moving. "His new film is an adaptation of a cult novel by Ernest Cline which is jam packed with pop culture references from the 80s and 90s.Spielberg said: "I was really careful about making a transposition from one form to another - not all books can make transpositions to film. "Ernie's book was very difficult, it was very dense, it had so many facts, so many little moments of delicious trivia, it had a number of stories that could have been Ready Player One, but I collaborated with Ernie." "As opposed to cut out the writer, I included the writer along with Zak Penn who wrote the screenplay, and all of us together found the right kind of translation from one form to the next and I think we're all really happy with the result. "As the film is largely set in the virtual reality world of The Oasis, where the main characters are desperately trying to win a treasure hunt to stop their world falling into the hands of a large corporation, eight weeks of production was spent on motion capture.But the filmmaker says despite the leaps in technology since his career began, he is careful not to rely on visual effects to the detriment of the story. "The technology has changed to the extent that anything that we dream up can be realised and put on the screen - anything - and that's a great benefit and a tremendous danger. "The benefit is you can actually say: I have a dream, I have a vision, and I can actually capture that and not have to compromise it. "The danger is you can do too much of a good thing, there are too many tools and you can almost overload something." For example, he tried not to fall into that trap when making Ready Player One - which features cameos from Godzilla, Marty McFly's DeLorean and the chest-buster from Alien. "Ready Player One is essentially a story, a straight narrative story about a contest, about young people who are living in impoverished conditions, living in a very totalitarian world, that have found a place to play, to get to know each other, to clan up - become friends, and win this tremendously amazing contest against the corporate greed of the bad guys," Spielberg explained. "The way I describe it is: If you're in a vehicle called a movie, the story is straight ahead out your windshield, and all the cultural references are out your left and right side windows, and you can choose to look left or right, or to look straight ahead at the story - it's your choice. 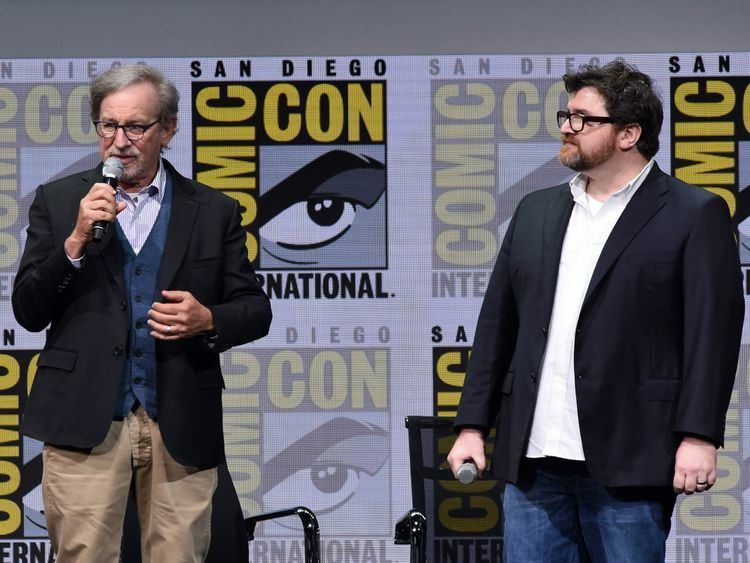 "Cline has said he is working on a follow-up to his 2011 book, but Spielberg is coy about whether he would want to work on a sequel to the film. "I haven't even read it," he said. "I know he is [writing] but he's keeping it under wraps so I don't know quite what the story is. "Ready Player One is released in cinemas in the UK on Friday.